The Bridges Music Program is a program of MAESTRO Ensembles, Inc., a non-profit organization dedicated to bringing the gift of music education to children in Baltimore. 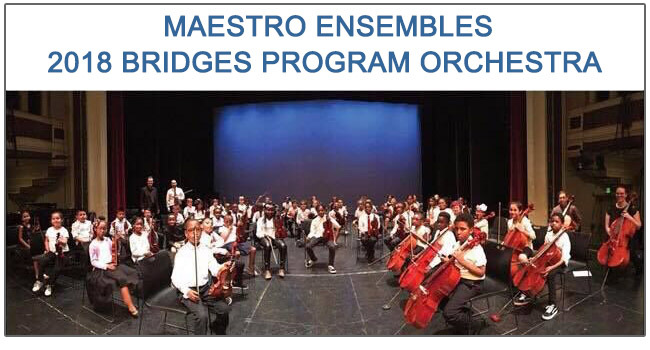 Originally founded as an educational program of the former Greater Baltimore Youth Orchestra Association in 2006, the Bridges Program began operating independently as a program of MAESTRO Ensembles, Inc. in September 2012. The program provides a string instrument – violin, viola, cello or bass – at no cost to families, twice-weekly small group instruction, and weekly orchestra rehearsals once students are ready. 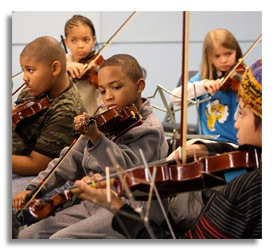 The Bridges Program was started to address the need for string education opportunities for children in Baltimore City Schools following significant budget cuts to funding for arts programs in the schools. 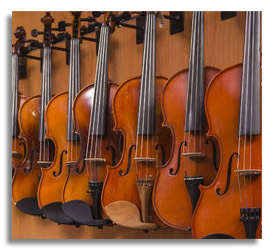 Our curriculum follows modified methods of the highly successful “Suzuki” string pedagogy while incorporating state standards for music education as classes progress. 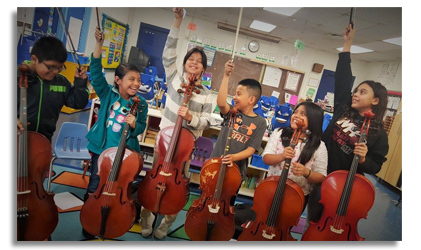 In addition to receiving twice-weekly small group instruction by instrument, students are able to participate in a weekly string orchestra rehearsal and have at least one large performance each year. All sites follow the same basic curriculum, but teachers are encouraged to use their own style and supplement with games and creative activities of their choosing. Students are also given leadership opportunities and the chance to develop improvisation skills during classes. Bridges Program teachers are chosen based on their commitment to the value of providing warm, supportive, quality music education experiences for children in Baltimore City schools. For more about our faculty, please visit our “People” page. The educational program has been administered by Program Director Laura Ruas since 2015. Over the past twelve years, the program has served over 1,500 students in Baltimore. In its early years the Bridges Program reached large numbers of children and provided an excellent foundation, but only a small number of them continued playing into high school and beyond. To create an infrastructure for children to continue studies begun in the Bridges Program, we entered into a formal partnership with TWIGS, a free after-school and Saturday arts program at the Baltimore School for the Arts. Bridges starts a large number of students on their musical journey, and once they have completed the Bridges program, they have the opportunity to continue that journey thanks to TWIGS. Some have even gone on to enroll in the Baltimore School for the Arts as high school students. The Bridges Program reaches students primarily through existing Baltimore City after-school programs. For the 2017-2018 academic year, Bridges is in residence in programs at Wolfe Street Academy, Govans Elementary, Thomas Johnson Elementary Middle, and Baltimore Montessori Public Charter School. For more about our site partners, or to explore how your after-school program might become a Bridges Program site, please visit our “Schools & Sites” page. Funding for the Bridges Program comes from diverse sources: our partner sites, individual donors and family foundations, corporate sponsors, and various granting organizations. Past grants have been received from the National Endowment for the Arts, the Maryland State Arts Council, Creative Baltimore Fund, and the Mr. Holland’s Opus Foundation. Instruments are donated from many individual families as well as Gailes’ Violin Shop and the Elville Center for the Musical Arts. Please visit our “Support” page to see how you can help this remarkable program. 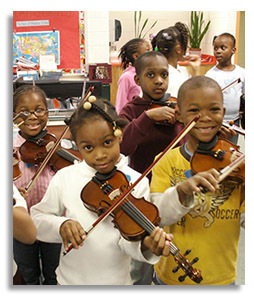 The mission of the Bridges Program of MAESTRO Ensembles, Inc., is to reach a large, currently underserved population of students in Baltimore City, giving those children equal access to high-quality beginning string instruction, use of an instrument, and orchestral experiences without respect to financial circumstances. To give students a valuable tool to expand opportunities for creativity and self-expression, cooperative learning, academic success, and self-esteem. To identify talented students at an early age and to support their musical training, offering them quality instruction, instruments, and a full range of orchestral experiences. The orchestras of the Baltimore School for the Arts and other Baltimore music institutions will benefit from the diversity of these students if they continue with the program past the initial Bridges instruction years. 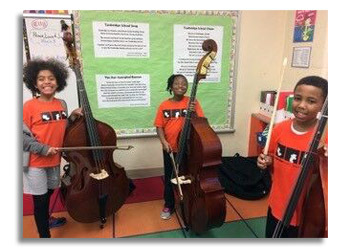 To serve as an impetus to start or expand opportunities to study music, particularly stringed instruments, within the Baltimore City Public Schools system. To stimulate the development of specific training for music teachers for inner-city populations, to ensure the long-term success of the program. To create a program in partnership with other City institutions that address the mission without either duplication of efforts or competition. To be a model for extra-curricular music education in other cities.